Ed Jones capped a tremendous title-winning campaign in 2016 with the receipt of the prestigious Earl Howe Trophy at the British Racing Drivers’ Club (BRDC) Awards, as he celebrated his Indy Lights triumph in style in the presence of the motorsport glitterati. Held in the opulent surroundings of the Grand Connaught Rooms in London’s Covent Garden, amongst the well-known faces at the BRDC Awards was new Formula 1 World Champion Nico Rosberg alongside legends of the sport Sir Stirling Moss OBE, Nigel Mansell CBE and Damon Hill OBE, meaning the talented Dubai, UAE-based ace was in exalted company indeed. The Earl Howe Trophy is presented annually to the most successful BRDC Member racing in North America. Competing for single-seater powerhouse Carlin, Jones sped to a brace of victories, eight podium finishes and eight fastest laps in Indy Lights this year, ultimately clinching the coveted and fiercely-disputed crown at the end of a tense season finale at Laguna Seca – the youngest BRDC Member ever to do so. The 21-year-old Brit’s stellar performances brought him to the attention of a number of Verizon IndyCar Series teams at the pinnacle of the Mazda Road to Indy ladder, and Jones will duly graduate to the top flight of US open-wheel competition with Dale Coyne Racing in 2017. “It’s a great honour to be awarded the Earl Howe Trophy – just looking at the incredible roll call of drivers to have won it in the past like Dan Wheldon and Dario Franchitti is truly inspirational, and it’s amazing to have now added my name alongside theirs,” enthused the Williams-Harfield Sports Group protégé and former European F3 Open Champion. “It’s really rewarding to be recognised for everything we’ve achieved over the past couple of seasons – it underscores how far we’ve come since moving to the States in 2015, and there are so many people who have been instrumental in that success. “It was definitely a gamble to walk away from Europe to chase the IndyCar dream, but it’s one that has paid off through a lot of hard work – especially this year, when we really had to fight for the Indy Lights title up against a lot of tough opposition. “IndyCar will unquestionably be another big step, but I’m feeling ready for it and can’t wait to get stuck in. I’ve had chance to spend a little bit of time with the DCR guys and get to know everybody there and we’re already forming a close bond. 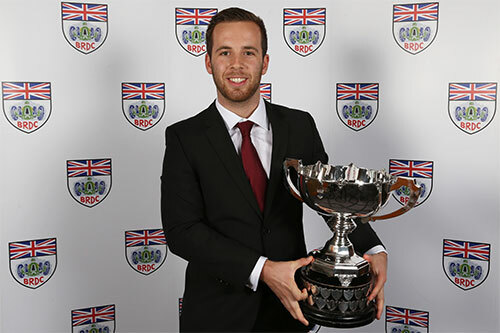 “The BRDC are thrilled to award Ed with the Earl Howe Trophy after establishing the most meritorious performance of the year by a BRDC Member in North America,” added Club Secretary, Gillian Carr. “It is incredibly satisfying to see that Ed, in his second season competing in Indy Lights, applied what he had learned in the formative years of his career in Euroformula Open and the FIA Formula 3 European Championship and demonstrated his class to come away with an iconic victory in a very competitive championship. It is the first time since 2007 that a driver of British origin has won the Indy Lights title.